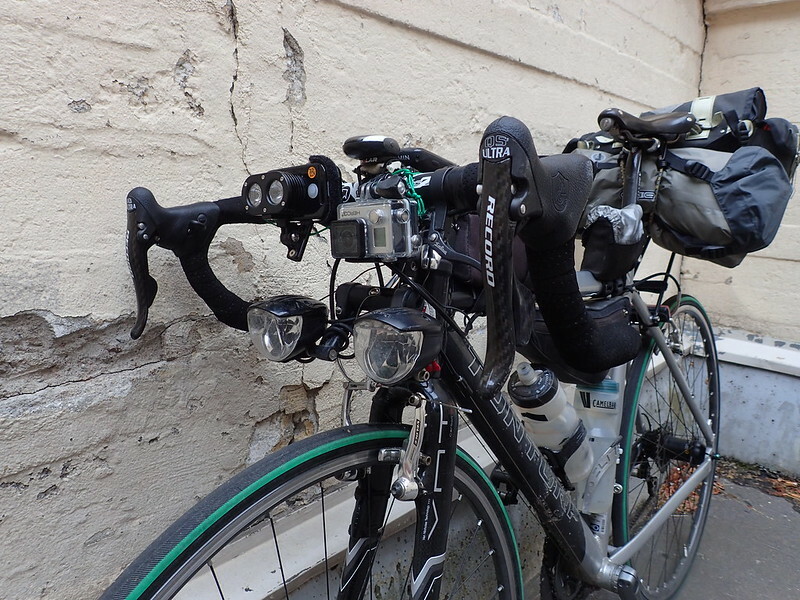 I tried to cover everything I’m using at Transcontinental race this year. 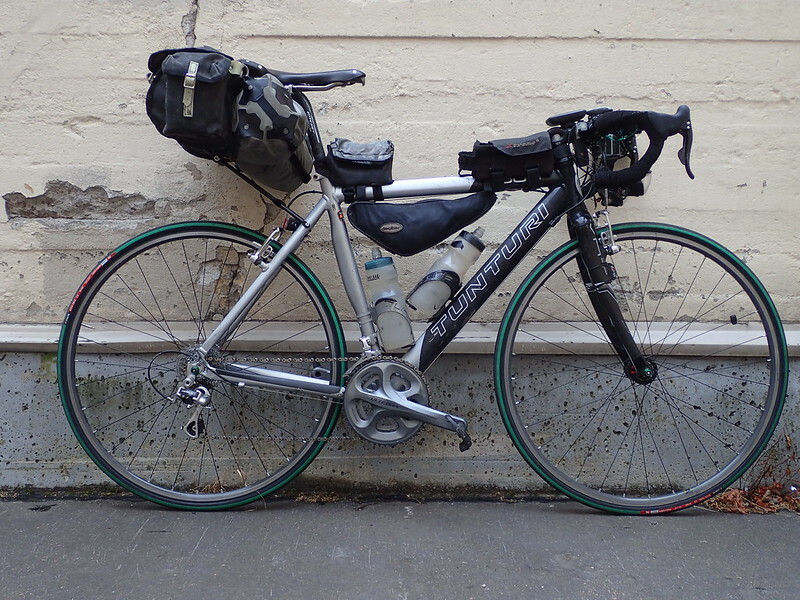 The bike. It looks a lot like it did last year. Open pave tires, Powertap and Son Deluxe hubs with open pro rims. 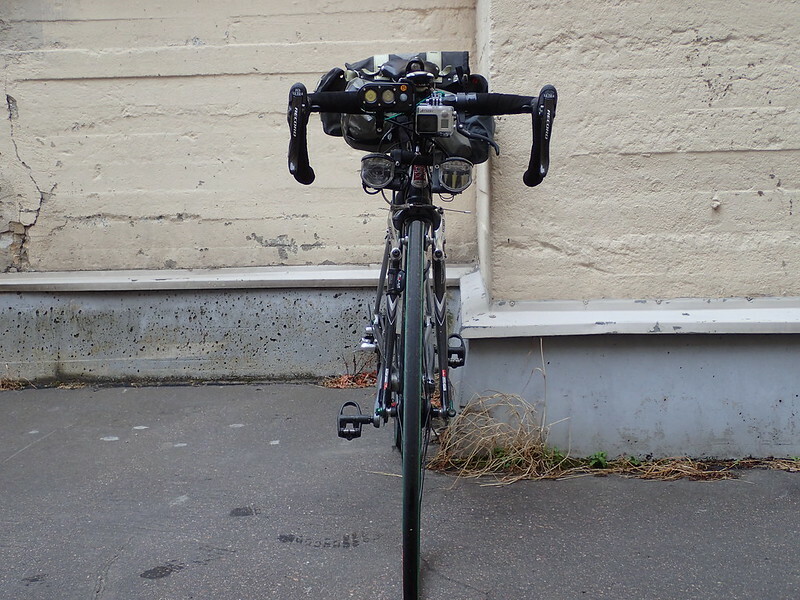 Brooks saddle and the usual components. I am a bit afraid of the dark so I have 2x luxos (U/B) dynamo lights and MyTinySun Folkslight battery light. GoPro, and Folkslight, are this time tethered properly. The usual dashboard is as last year. CS600 for heart rate and distance. Edge 810 for navigation and power. 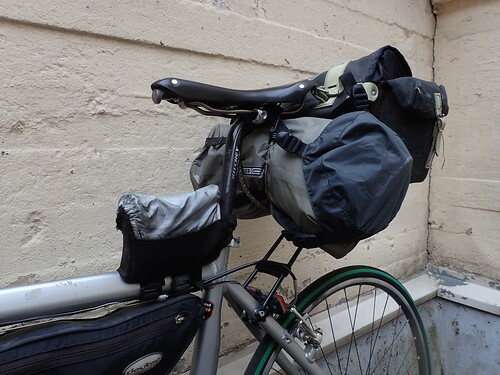 Carradice Nelson with Ortlieb dry bag attached. 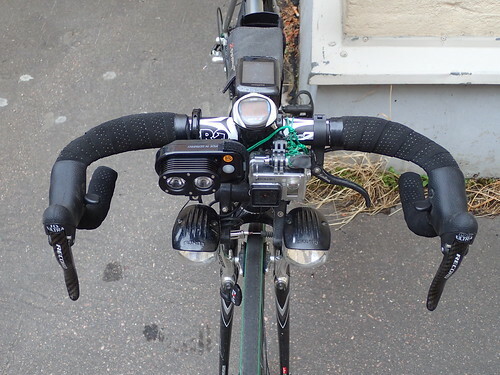 B&M Toplight mini dynamo rearlight for visibility and Niterider Solas2 battery light to blind everyone behind. Mostly using the dynamo light. 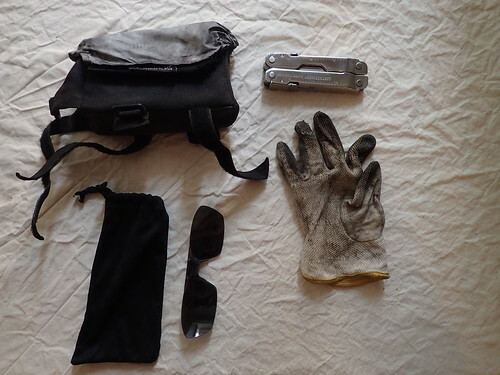 In Topeak Tribag a work glove, multitool and clip-on sunglasses. It is also used as a trashcan. 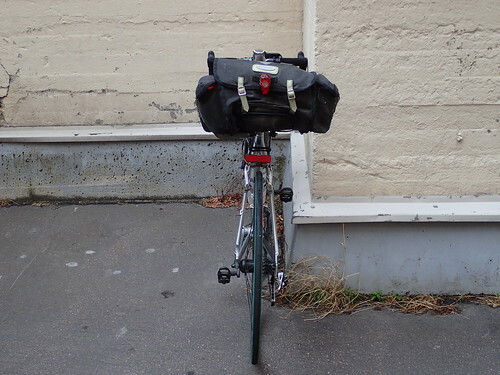 The other frame bag is for food only. 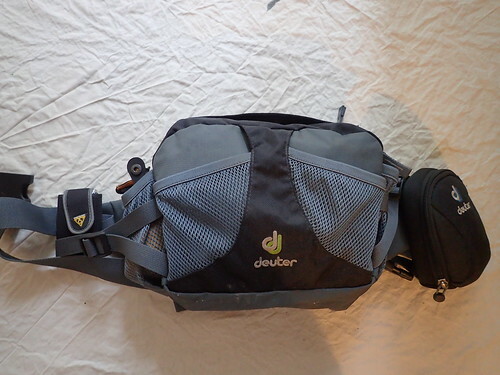 Deuter triangle bag for most used extra clothes. 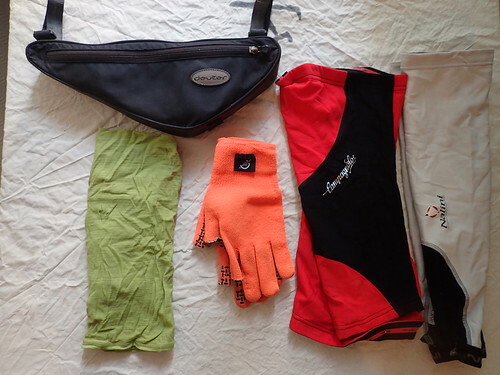 Arm warmers, knee warmers, gloves and Buff. Tools are in the Nelson. Spare clothes. 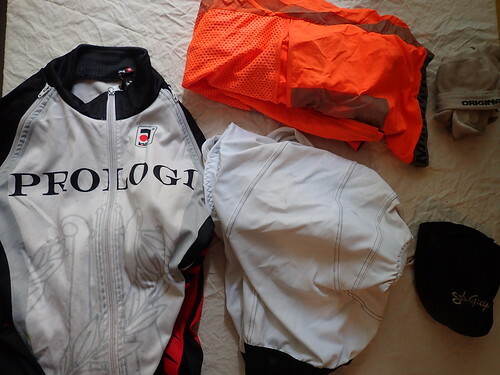 Shorts, wind-/waterproof jacket, toe warmers, reflective (wind) vest and a pair of socks. 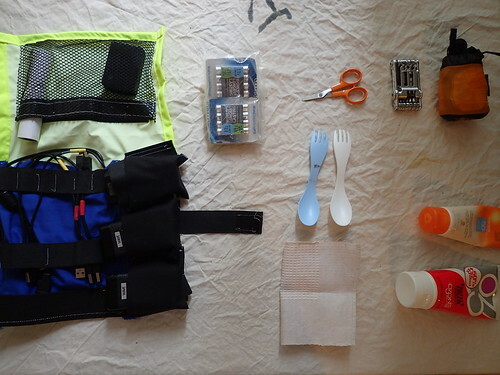 This year I’ll use hip pack instead of backpack. 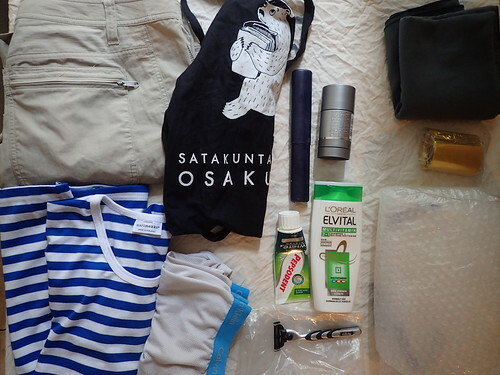 In the hip pack chamois cream, sunblock, electronics (3x micro-usb, 2x mini-usb, Olympus usb, 2x 2 slot usb chargers, Topeak and Nokia power banks, 12x lithium aaa:s (for SPOT and headlight), GoPro bacpac and Topeak multitool. Also a rag for cleaning hands (or/and anything except chain, really), scissors and 2 sporks. 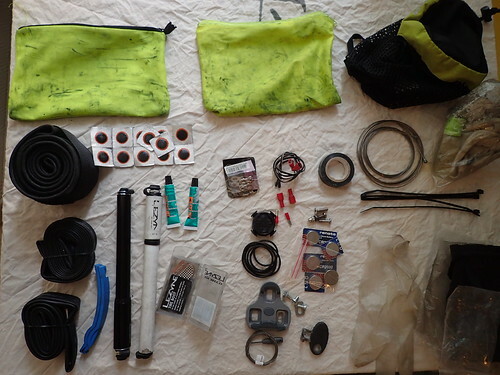 Packable Sea-to-Summit 30 litre backpack (the yellow thing in top right corner) as I don’t have a real backpack and I still need to carry food. 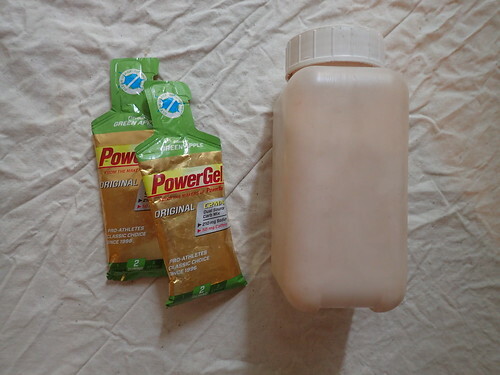 Also in the hip bag some (350 g) Powerbar drinking powder (the one with some caffeine and protein) and emergency ”food”. 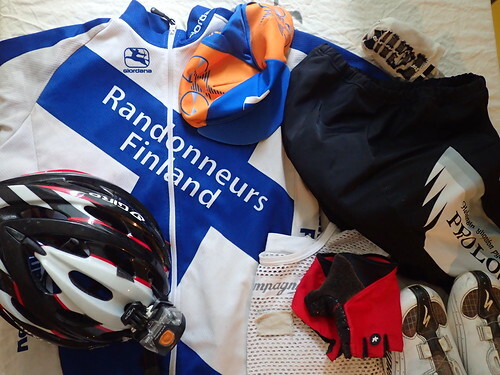 The kit I’ll be wearing. Only thing changed from last year is gloves. + I’ll probably be wearing the event cap instead. 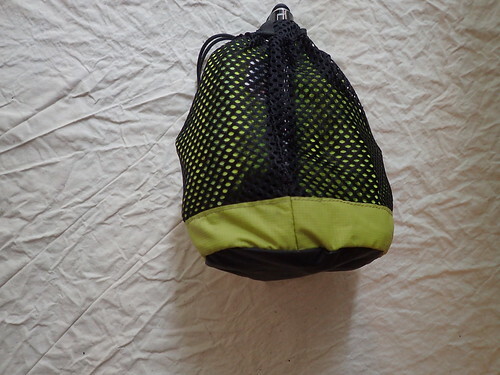 In helmet there is Petzl Tikka 2 xp light that is easy to remove for day time. Finally my pockets from left to right. 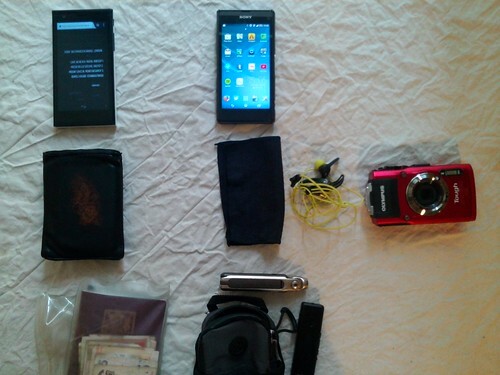 Primary phone, wallet, passport. Secondary phone, multitool, headphones and handsfree (when not in use). In rightmost pocket Tg-3 camera. Kategoria(t): varusteet. Kirjoittaja: mkpaa. Lisää kestolinkki kirjanmerkkeihisi.